Just What Did The Ancients Think? Modern physicists theorize that all the substances (matter) of the world are basically made up tiny charged particles. So tiny are these particles that physicists don’t separate the thing from the charge (+,-). So, basically, physicists don’t make a distinction between matter and energy. Matter and energy are one and the same. Believe it or not, the debate over exactly what makes up the world is not a new one. In fact, it is very ancient, going back at least three thousand years, if not more. We will explore what the Ancients thought by examining the theories of the ancient Greeks, Chinese, and Indians. See what they have in common with each other and with modern thought. 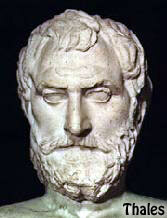 A. Thales of Miletus 624 B.C. – 548 B.C. Thales lived just as the Greek world was beginning the Classical Age. He started a movement in philosophy and science (which were the same to the Greeks), which sought to explain the natural world through observation. These early Greek philosophers are known as the pre-Socratics, because they theorized before the time of Socrates. Thales is the first pre-Socratic philosopher/scientist. 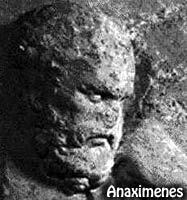 B. Anaximander 610 B.C. – 530 B.C. 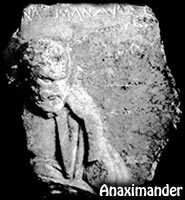 Anaximander was a student of Thales. He theorized that the world was made up of conflicts between exact opposites, like hot and cold, wet and dry. 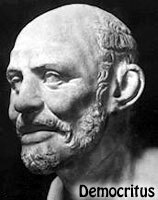 Anaximenes believed that air was the basic element from which everything is made. He believed it could become hot and turn to fire, condense and become clouds or water, and condense even further to become solids. He was the first to theorize on the conservation of matter and energy. He believed that matter and energy were neither created nor destroyed. What was here was here, and substances merely changed from one form to another. Empedocles was notable only in that he was the first to state the generally accepted view among the Greeks that the world was basically made of four elements: earth, wind, fire, and water. He took the theories of those before him and put them all together. 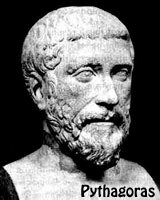 E. Pythagoras 570 B.C. – 490 B.C. Pythagoras believed that mathematics was the basis for reality. He believed all things consist of number. He believed matter and energy were both number. In other words, he saw the entire world as a bunch of numbers, which related somehow mathematically. He is most famous for his Pythagorean theorem, which shows the mathematical relationships of the sides of a right triangle. He was also unusual for his day for believing in reincarnation. This is the belief that all beings die and are reborn as other beings. Pythagoras believed in a “fifth element” which he called Aether (Ether). He considered it to be the imaginary substance filling all the space between the planets and stars. F. Heraclitus 540 B.C. – ? Heraclitus believed all substances were composed of an energy source called logos. He thought logos made up the rocks, trees, rivers, etc. Everything fit together in a harmonious whole. He believed this harmony was a product of forces that opposed each other, creating continual tension. He believed everything was in constant motion and change. 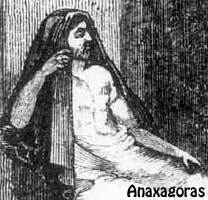 Anaxagoras was the first to theorize that all things were made of extremely small particles. 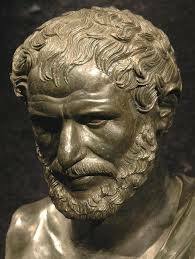 Democritus carried the idea further by naming these particles “atoms.” He believed atoms were small, round and solid. The ancient Chinese observed their world and decided the world was made of essentially five elements: metal, wood, water, fire, and earth. The ancient Chinese also observed that these elements tended to oppose each other: water puts out fire, fire melts metal, metal chops wood, etc. From this observation of opposites, the ancient Chinese deduced that there must be opposing forces (energies) in nature. They called these forces Yin and Yang. The ancient Chinese believed that put together, the Yin/Yang balance each other out to create the pervading energy that is the source of everything. This force they called the Tao. The Chinese believed that when Yin/Yang were balanced there was harmony (Tao). Everything in nature was peaceful, happy, and healthy. When Yin/Yang were out of balance, something in nature was not peaceful, happy, and healthy. The ancient Chinese took this concept of balancing/opposing energies and applied it to living beings. Since people were seen as a part of nature, then people must be balanced if they were going to be peaceful, happy, and healthy. The ancient Chinese believed that people must have a life force whose Yin/Yang must remain balanced for optimum health. They called this life force Chi (Qi). The Chinese believed the Chi spreads from the center of the body outwards through channels in the body called meridians. If a person becomes ill, there must be a disruption in his/her Chi. Ancient Chinese doctors (and modern acupuncturists), looked to these meridians to see if anything was blocked, and used various methods to unblock them. To understand this, think of water flowing through a garden hose. The hose represents a meridian. The water represents the Chi energy. If the hose gets a knot in it, the flow of water is disrupted. To fix the problem, just untie the knot, and the water (energy) will flow again. The ancient Chinese sought to unblock clogged meridians through acupuncture, herbs, and exercise. By the way, the ancient Indians, Greeks and Romans had the concept of a life force. The Indians called if Prana. The Greeks and Romans thought the life force came from one’s breath. The Greeks called it Pneuma, and the Romans called it Spiritus. 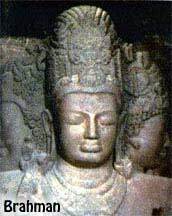 Ancient Indian yogis had very sophisticated philosophies on the nature of the world. They believed that everything was made up of two elements: the unreal (energy), and the real (spirit). Can you say that again in English? Okay, I’ll try. Brahman is the one life, mind, and infinite reality. Brahman takes many forms. Everything comes from it. Since Brahman is the one reality that is part of everything, you are part of it. This part of you is called Atman (soul). Your Atman and Brahman are not really different from each other. Think of your soul as a drop of seawater. That drop of seawater has the same properties as the ocean it came from. You’re the drop of water, and the ocean is Brahman. You cannot perceive Brahman with your senses. Your senses trick you into seeing a world that is an illusion. This illusion world is comprised of energy. Pretty heavy stuff, huh? So, ancient Indian yogis would agree with the modern scientific view that all matter is made of energy. However, these yogis believed that this energy was an illusion. Think of the Matrix as an example. Neo lived in a world of illusion designed by computers. The computers used electric energy to create these illusions. Then Morpheus awakened Neo to reality. The ancient yogis believed that when you were awakened to the reality of the world, you became enlightened. How are the theories of Anaxagoras and Democritus similar to modern theory?